CARYS DAVIES was born and grew up in Llangollen, in north Wales, and spent ten years living in New York and Chicago. She now lives in Lancaster, in the north of England, with her husband and four children. Her stories have won prizes in national and international competitions, including the Orange/Harpers&Queen, Bridport, Fish and Asham awards, and have been published in magazines in the U.K. and the U.S. 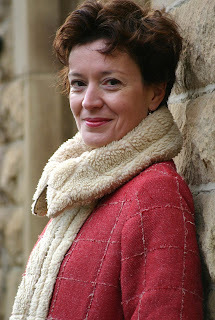 Her début collection of stories, Some New Ambush (Salt Publishing, 2007), was described by Boyd Tonkin in The Independent as “darkly funny and unsettling” and was longlisted for the 2008 Wales Book of the Year Prize. It was recently longlisted for the 2008 Frank O’Connor International Short Story Award. Davies, who is currently working on a new collection of stories, recently spoke to Eric Forbes and Tan May Lee in an e-mail interview from her home in Lancaster, England. I had an e-mail from Tania Hershman, who edits the The Short Review, which is a new online magazine dedicated to short stories. I went online to the Frank O’Connor website to have a look at the whole list. It certainly is long! There are 39 titles this year from all over the world—Asia, Australia, Europe, North America and Africa. It struck me that there are perhaps fewer big names on this year’s list than in previous years. Last year, for example, we saw among others, Alice Munro, David Malouf, Mary Gordon, Tessa Hadley, Claire Keegan and Miranda July—who eventually won with her collection No One Belongs Here More Than You. I’m familiar with a handful of names on this year’s list—Roddy Doyle, of course, and Anne Enright. Also Jhumpa Lahiri and Clare Wigfall, and all my fellow Salt Publishing authors, but I have yet to get to know the others. I think I first heard of it a couple of years ago, when it would have been in its second year. I remember reading that Haruki Murukami had won, and it was that that introduced me to his work. I’ve never written a novel but I would imagine there are enormous differences. Short stories are much closer, I think, to poetry than they are to novels in that their shape and structure are so much less forgiving. Short stories are terribly precarious things which have a tendency to collapse in a heap if some little thing in them isn’t quite right. A false note, a single distracting line, a paragraph which is too long or too short—they all have the power to kill a short story. I also think there must be a big difference in the way that they are conceived. Short stories are very difficult to plan—if I ever set out to write a story with a clear sense of what’s going to happen it’s almost guaranteed to fail; somehow it never achieves that sense of both surprise and inevitability that a short story depends on for its success. I first began writing short stories when I was living in the United States during the 1990s. It seemed a very natural thing to do there; the short story was alive and well—still championed by magazines like The New Yorker and The Paris Review and by literally hundreds of other smaller literary magazines. So it was a shock to return home to Britain to find publishers wary, if not downright hostile, to the form. There seemed to be a prevailing view that if you write short stories then you must surely just be practising for ‘the real thing’—the novel. I’m not at all sure that’s really changed very much. But I think there’s a sort of grass-roots movement going on, with more and more short-story writers performing at literary festivals, with book clubs choosing to read them, with the small independent presses supporting them and with the handful of new well-funded prizes being established—not only the Frank O’Connor but also the Edge Hill and the National Short Story Prizes. I think it has a lot to do with the big bookshops, where there’s very rarely a space dedicated to short-story collections. While poetry collections do tend to have their own special place in the store, story collections don’t—they’re put on the shelves with the novels, so it’s impossible for people to browse through them unless they already know an author’s name. And I can’t ever remember seeing a short-story collection on the ‘3 for 2’ tables. So perhaps the bookshops could experiment a little and see what happens.